Killed in the battle of Trafalgar in 1805, Nelson's body made the journey home in a barrel of brandy. His coffin was made from the timber of a French ship he defeated in that battle. 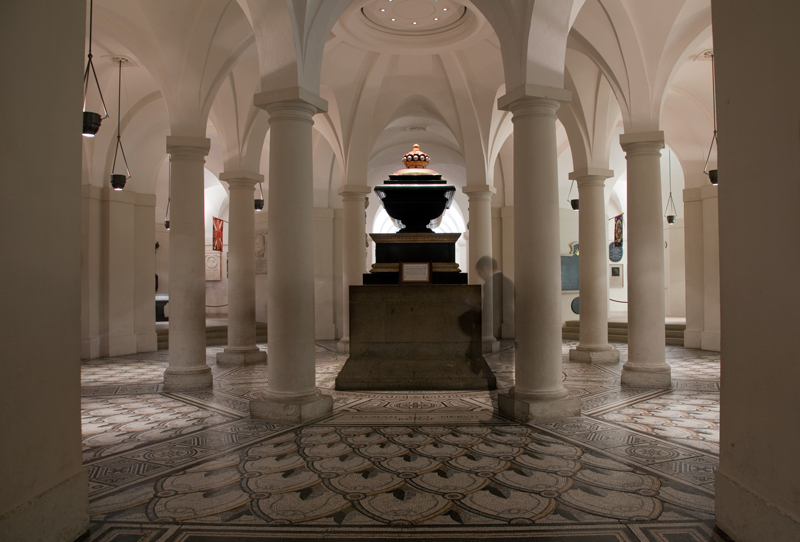 His tomb within the crypt of St Paul's Cathedral is somewhat flasher than the original. Is that a ghost or a shadow? 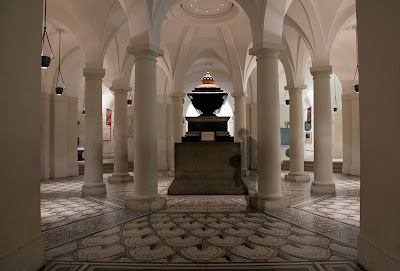 The crypt is so beautiful. From this angle the tomb looks like an urn . . . and who is the mysterious man? How DID you manage that shot? The man is genuinely transparent. Very impressive spot for a final resting place. I guess it was a long exposure shot on a tripod, so catching the guy who seems to be a 'ghost'. Fabulous shot of a fabulous place - so elegant! Those beautifully elegant white pillars and that floor, what a stunning space, love the addition of 'friendly' ghost, well done Mo.